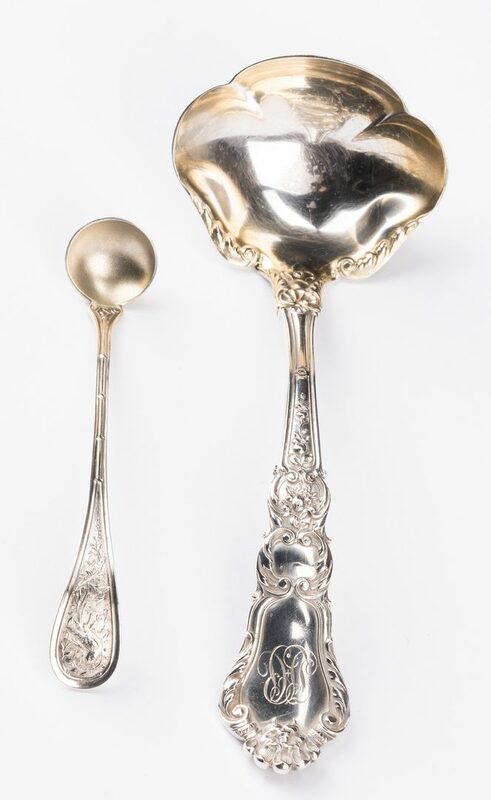 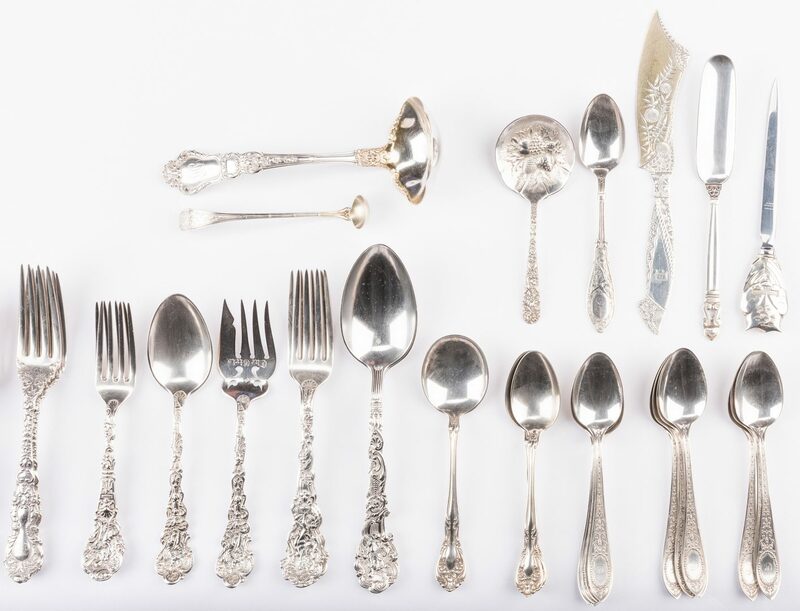 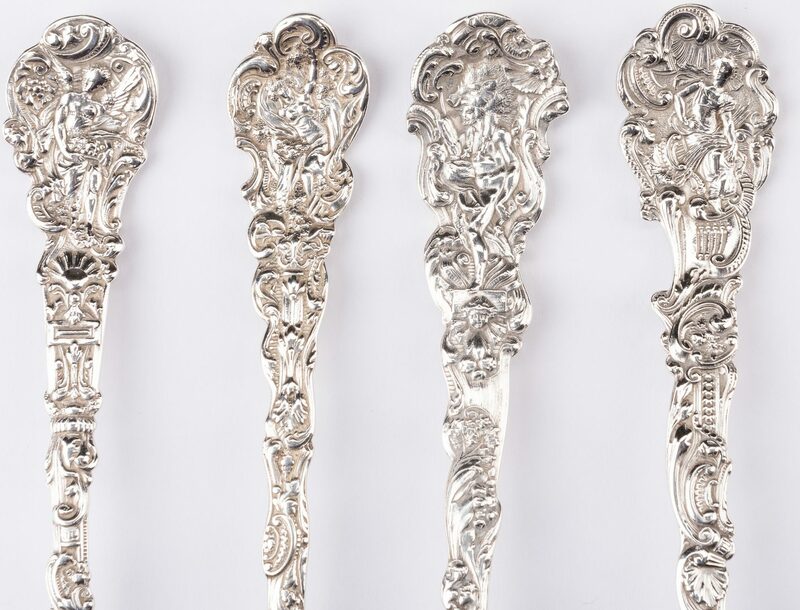 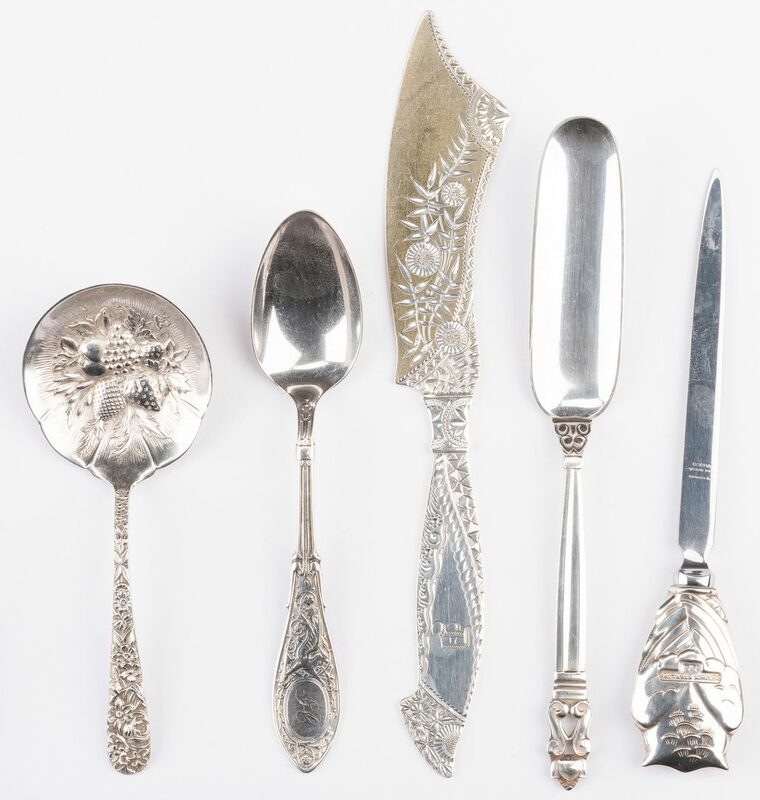 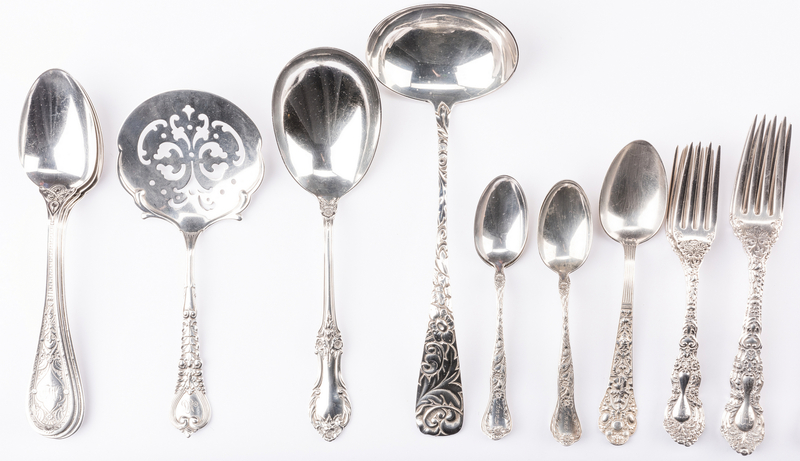 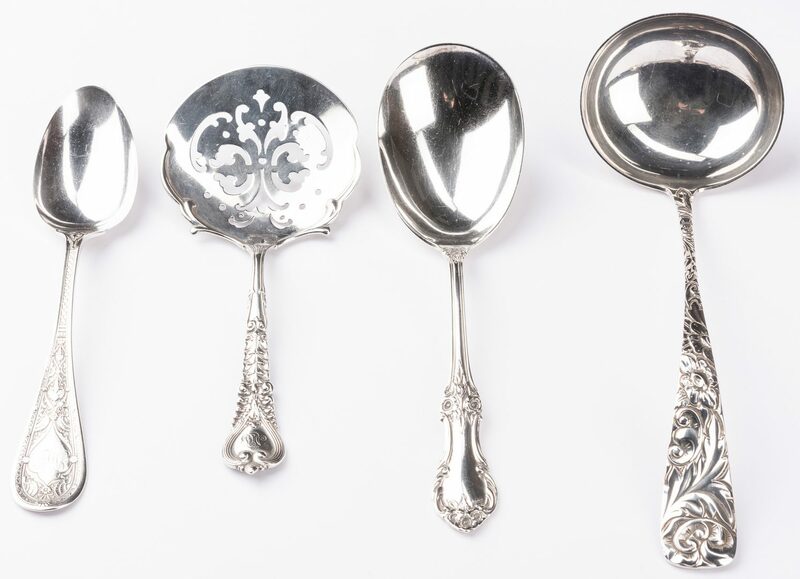 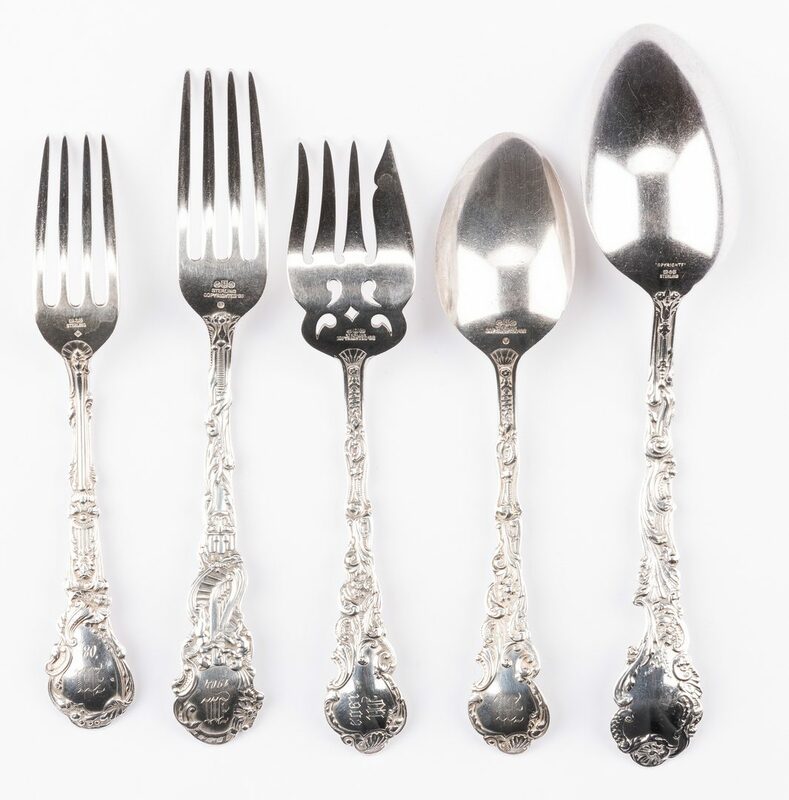 Group of 52 pieces sterling silver flatware in assorted and desirable early 20th century patterns including Tiffany Broom Corn, Jensen Acorn, and Gorham Versailles. 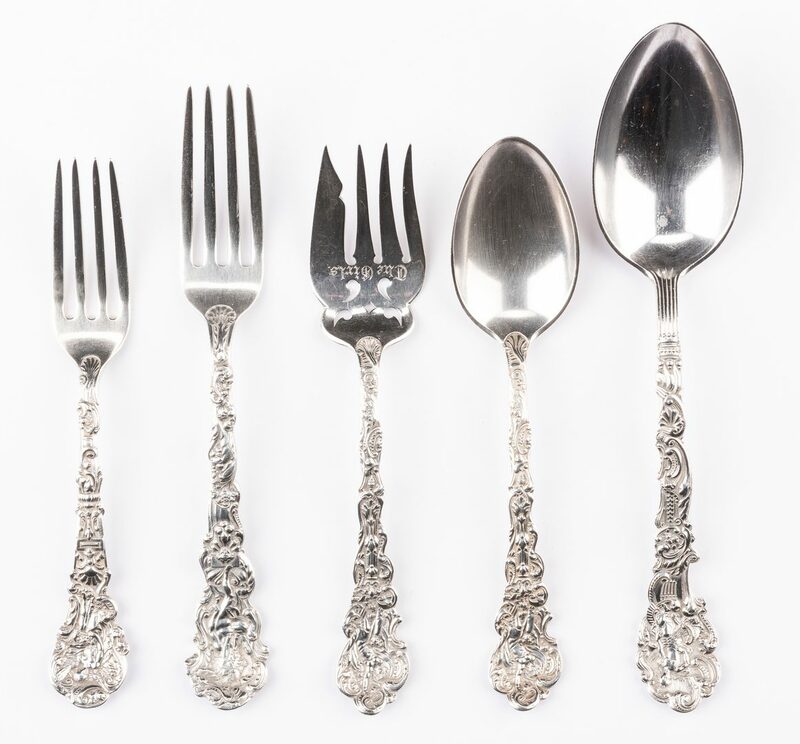 Includes 9 serving/novelty utensils and 43 spoons and forks. 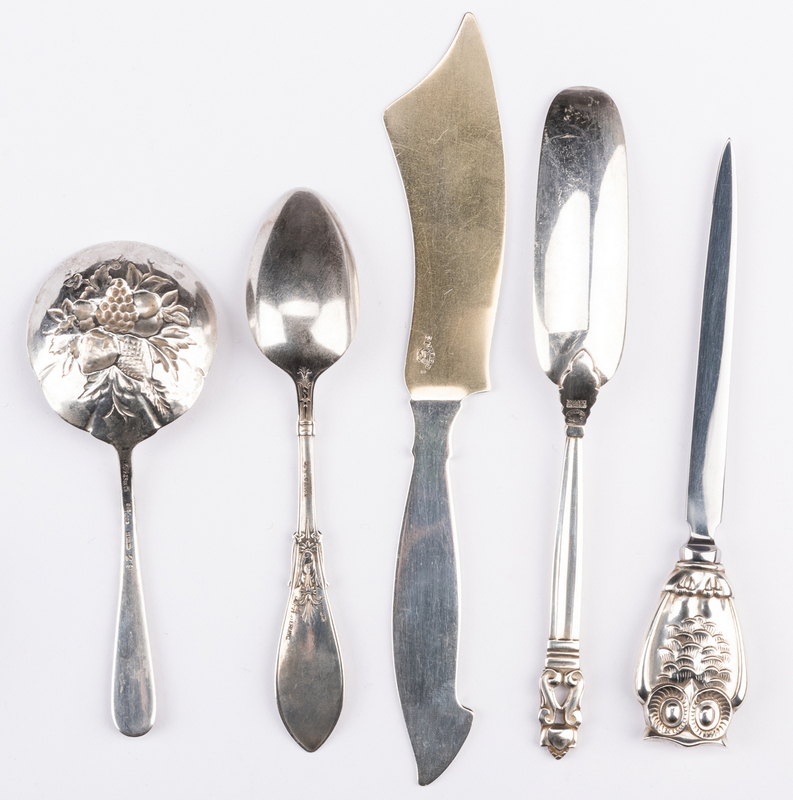 Serving/novelty pieces: 1 Tiffany Broom Corn pattern tomato or cucumber server, 7 1/2"L, monogram MS, 1 Durgin hand chased Scroll pattern ladle, 10"L, monogram MBW on back of handle; 1 Gorham sterling letter opener with figural owl handle; 1 George Jensen Acorn pattern cheese scoop; 1 S. Kirk & Son Co. Repousse pattern bon bon spoon; 1 salt ladle with chased pattern of bird in branches, retailer mark E. Jaccard & Co on back; 1 Whiting sterling master butter knife with bright cut engraved Aesthetic pattern and gilt blade, monogrammed D; 1 International Wild Rose pattern casserole or salad serving spoon, 8 1/2"L; and 1 Gorham Old Baronial pattern gravy ladle, monogram LHP. 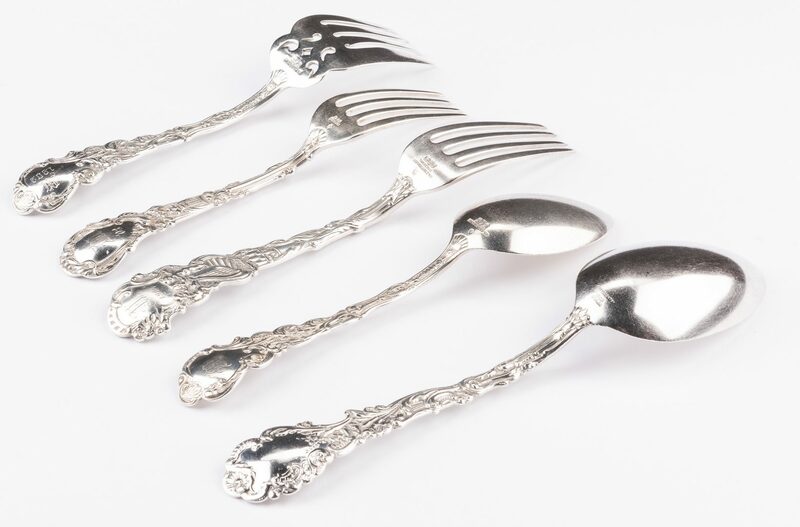 Group of 43 pieces spoons and forks includes 8 pieces Gorham Versailles pattern flatware (2 tablespoons, 2 dinner forks, 2 salad forks, 1 place or dessert spoon, some monogrammed H or M and 1904, plus 1 small meat serving fork engraved "The Girls"); 3 dinner forks and 3 salad forks in the Imperial Chrysanthemum pattern by Gorham, monogram H, W or M; 1 place or dessert spoon in the Old Medici pattern by Gorham; 4 tablespoons in the Persian pattern by Whiting, monogram MLO; 12 teaspoons in the Adam pattern monogrammed C plus 1 teaspoon in the Arabesque pattern monogrammed GC – both by Whiting; 3 teaspoons and 2 round bowl soup spoons in the Chateau Rose pattern by Alvin; and 6 teaspoons in the Marguerite pattern by Gorham, monogrammed Anna. 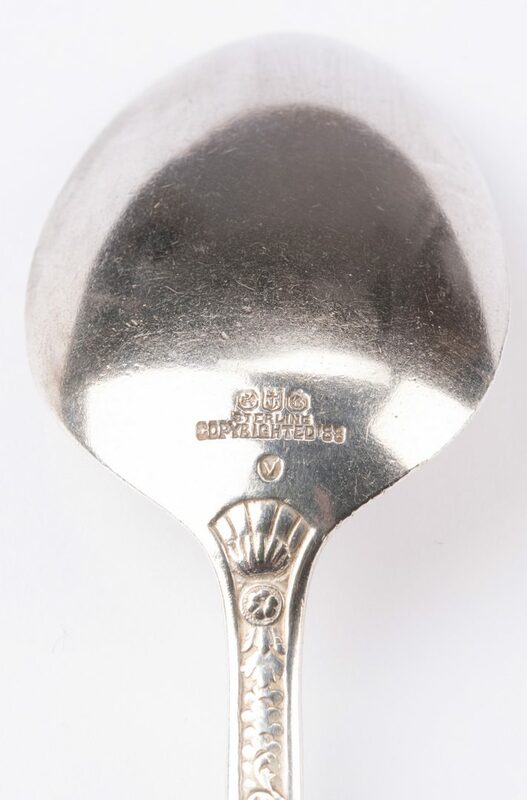 72.23 total weighable troy ounces. 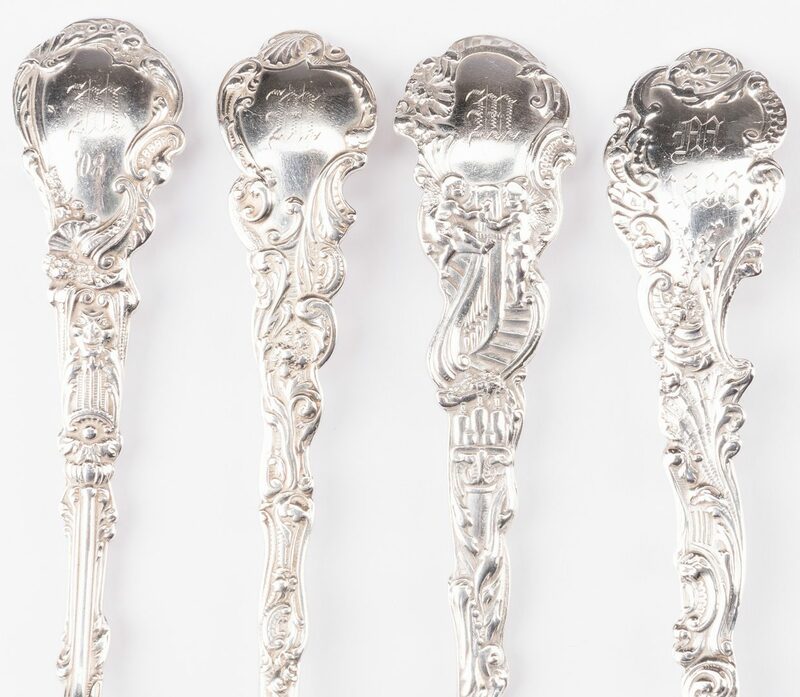 CONDITION: Several monograms exhibit some wear. 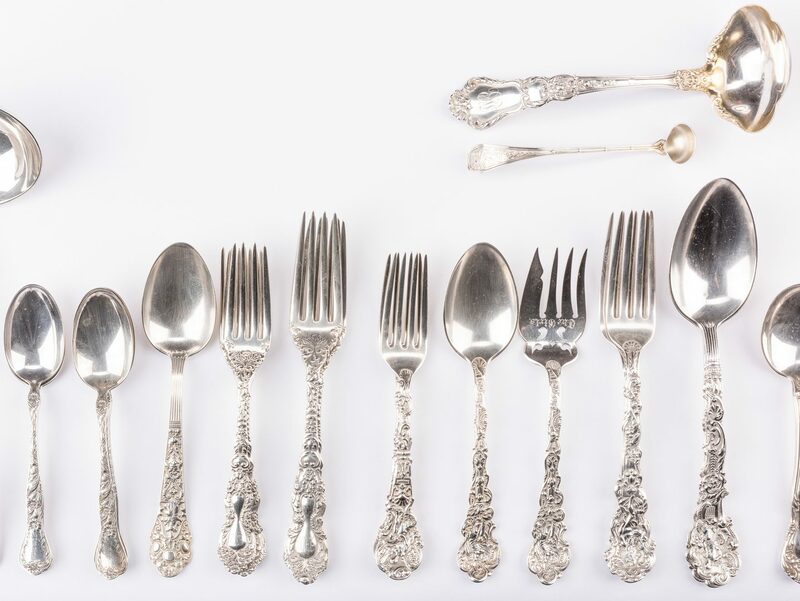 Overall all items in very good condition.